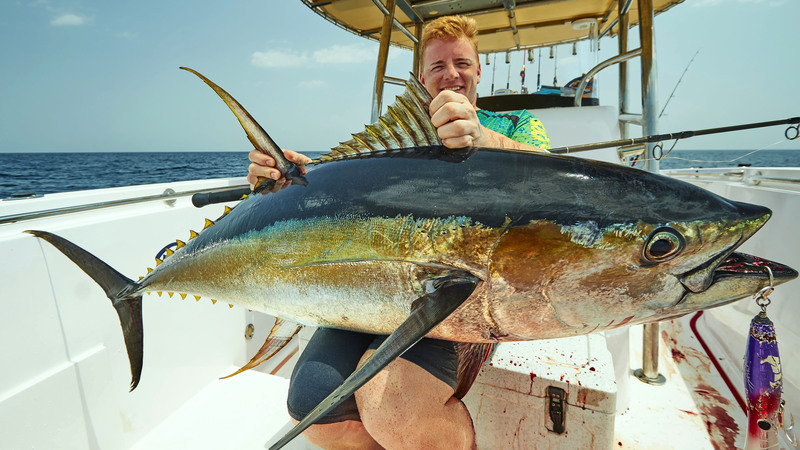 The Gulf of Oman has always been strong feeding grounds for the migrating yellow fin tunas (YFT). Then man interfered and things changed dramatically. Korean trawlers took their toll on the tuna stocks and the fishing went down. 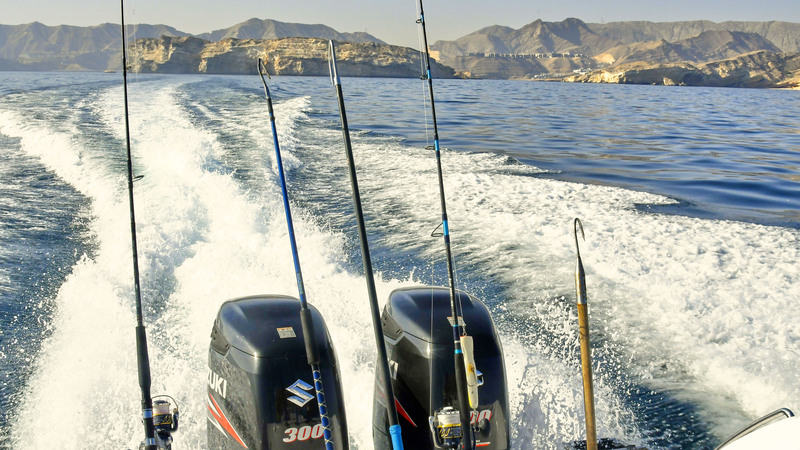 In 2009, the first step towards a recovery for the tuna stocks was taken: A Ministerial Decision prevented trawling in Oman and – and since then Omani waters has been free of any foreign trawlers. After some years without over fishing, the YFT started to bounce back, and in numbers no one would have expected. Around the same time, a young Omani navigational officer from Muscat, Ala’a Aziz, was scratching his itch for fishing whenever he could. He started chartering local captains and live baited for the YFT. Then he decided to take a trip to the US, fishing for bluefin tunas with popping gear, and this changed everything for Ala’a. 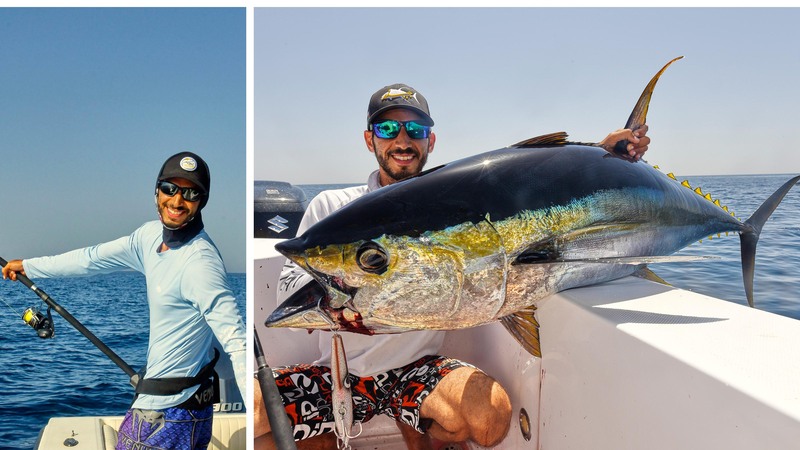 When he was back in Muscat he started pursuing his local YFT with poppers and stick baits – and he soon invited his new American friend, the renowned Sami Ghandour, to visit and help him explore the fishery. The results were amazing, and the tuna fishing just seemed to get better every year. Today, the YFT often average 40-45 kilos and several 90 kilo+ fish are hooked every season. 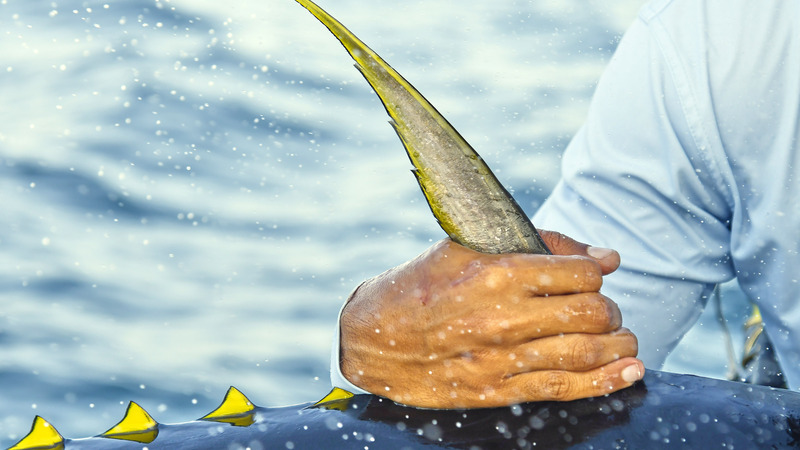 In 2016, Ala’a decided to set up his charter company Reel Therapy – the only operation specializing in Muscat’s prolific tuna fishery. At Getaway Sea Angling we are proud to be the exclusive partner for this fantastic fishery. Day 1: Arrival in Muscat, transfer to hotel or resort. Day 7: Transfer to airport for the flight home. Longer, or shorter, trips possible. Also possible to fly out in the evening after last day of fishing. 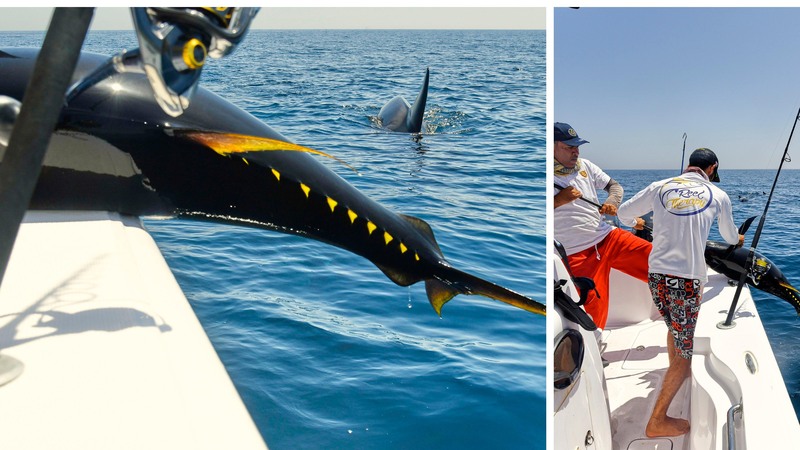 PRICE: From USD 3050 per person for a six nights, five days fishing package (longer or shorter stays are possible). 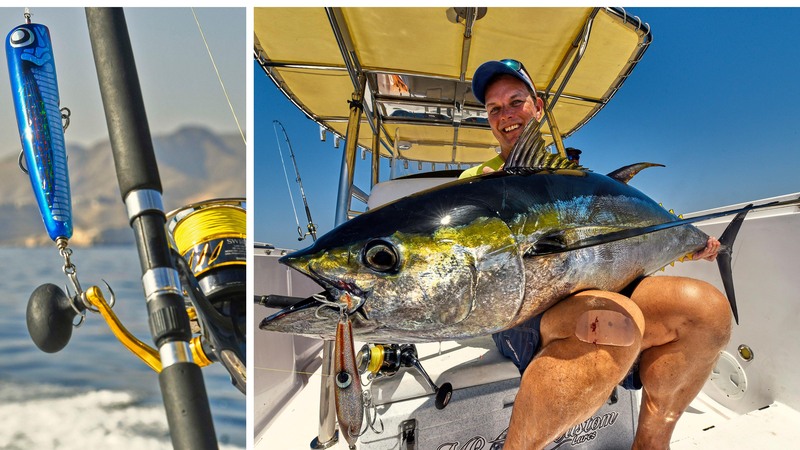 INCLUDED: Five full days of guided fishing (based on four anglers on the 38ft boat), six nights at a three star hotel (upgrade possible), all pick up and return transfers, breakfast at hotel, lunch and drinks on board on fishing days, use of popping tackle. 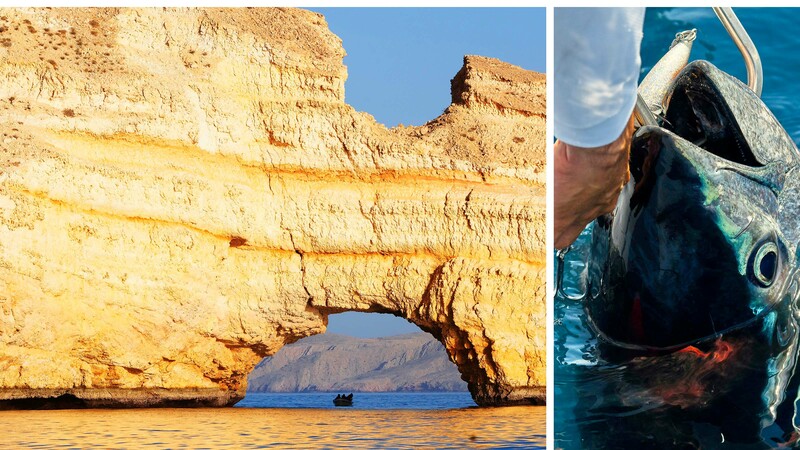 NOT INCLUDED: International flights to Muscat, evening meals and drinks and sport fishing license (approx. $100). 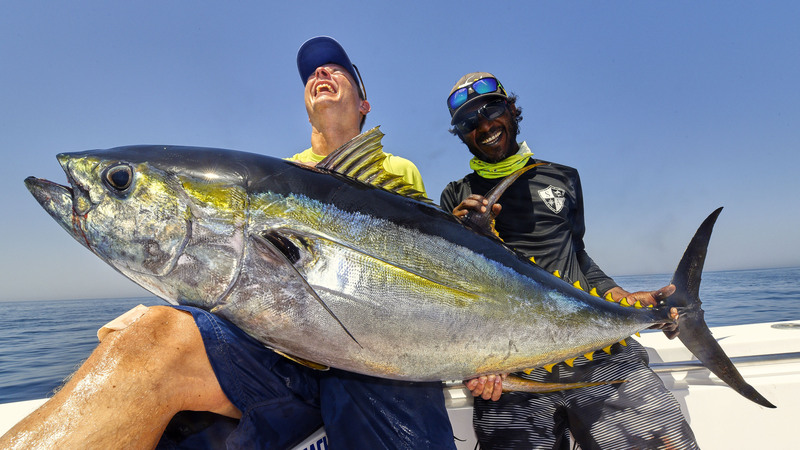 The fishing is almost all about tuna. There is often also long tail tuna around but yellow fin tuna is what we are mainly targeting. When the Reel Therapy team goes in search of tunas, one thing is certain: They search until they find them, or until the day is over. Often, the course is set towards fishing grounds 25-30 NM off shore. 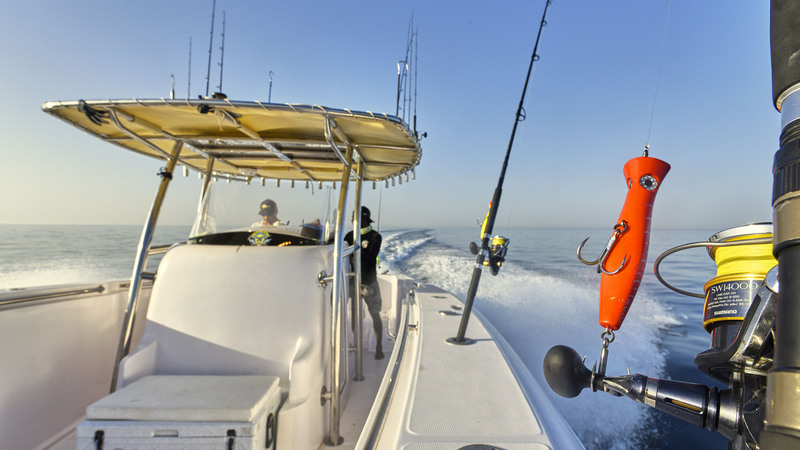 The sea is usually calm during tuna season so it’s a comfortable ride of around an hour. Of course, it happens that they find feeding YFT on the way to these spots, sometimes as little as 5-10 NM off shore. At other times, the search goes on for hours before the fish are found. Most often, a school of tuna will be located when they are busting bait on the surface – and when this happens, sometimes after hours of searching, then your cap hopefully sits firmly on your head: The captain will speed up, race towards the feeding fish, stop the boat and the anglers need to fire out their lures in the direction of the feeding tunas, as fast as possible. It’s a crazy, hectic and adrenaline-fuelled style of fishing! The yellow fin tunas in the Gulf of Oman average 40-45 kilos. Sometimes, there are smaller fish in the 15-25 range around, other times bigger specimens between 50-70 kilos appear – and occasionally really big fish of 90 kilo+ show up. Unlike, when we target reef species, this tuna fishing is not a Catch & Release fishery. Some fish die, some are killed – and some we aim to release. The tuna stocks around Muscat are very strong so bringing back some fish is totally acceptable. It is also possible to jig in 60-100 meters of water along the coast. 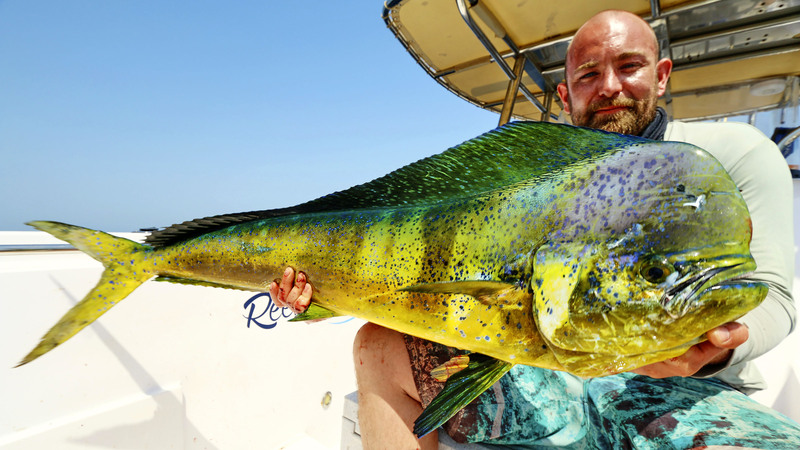 Species include dorado, long tail tuna, barracuda, various groupers and snappers. 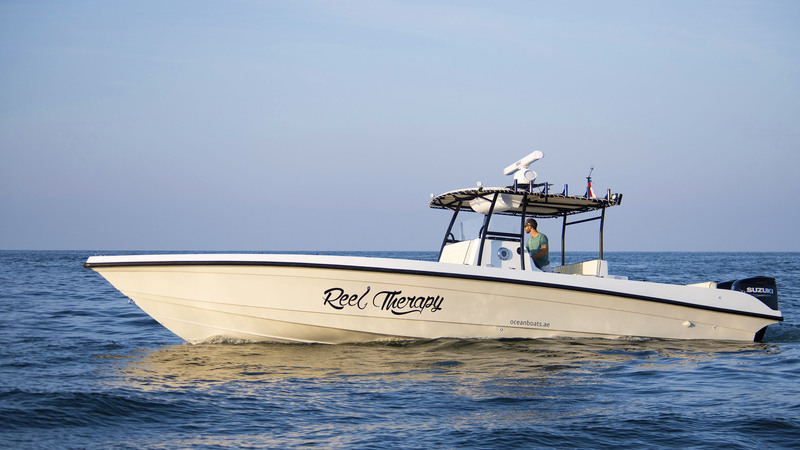 Reel Therapy is probably the best boat you will ever fish from. 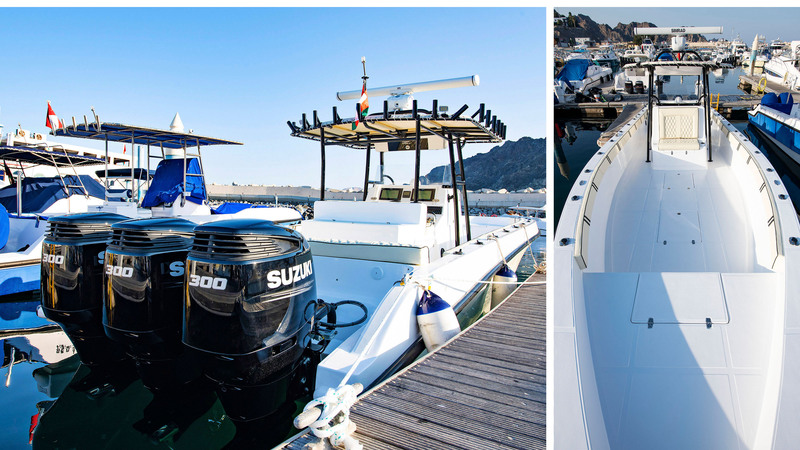 It’s 38 feet is powered by 3 x 300 HP Suzukis and with all electronics, radar, Auto Pilot, salt and fresh water wash-down, toilet and cooler. Our standard package includes all nights at a three star hotel but upgrades are possible. In fact, we have some fantastic options and this is one of the few destinations where a family stay at a secluded and exclusive five star resort with a private beach while the angler in the family gets picked up from the private jetty and heads out for some crazy tuna action. 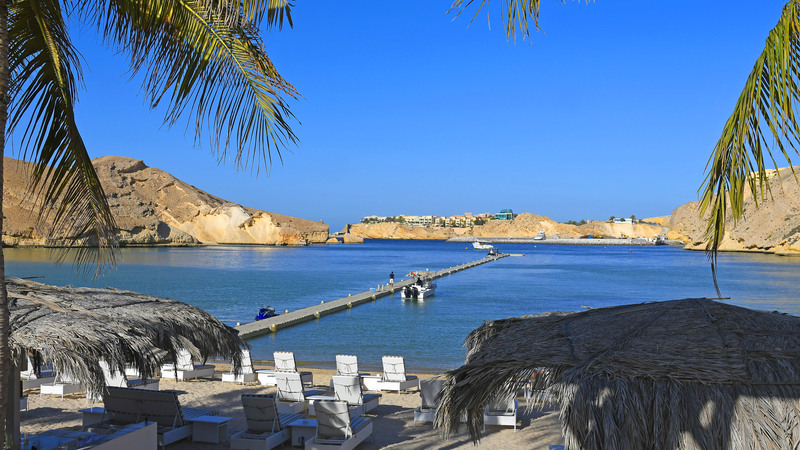 The climate of Muscat features a hot, arid climate with long and very hot summers and warm winters. Annual rainfall in Muscat is about 100 mm (4 in), falling mostly from December to April. In general, precipitation is scarce in Muscat with several months, on average, seeing only a trace of rainfall. The climate is very hot, with temperatures reaching as high as 49°C during the summer months. This is one of the very few destinations where there is surely no need to bring any rain gear! The use of a high quality popping rod and reel, terminal tackle and lures is included in your fishing package. Popping rods rated for PE6. Consider heavier rods, PE8 and PE10, in case some really big YFT show up. For the PE6 set up we favour slightly longer rods (between 8 and 8,5”) that casts really well. Shimano Stella in 14000 or similar with 60-80 lbs braid. PE8 and PE10 lines or braided line rated from 80 lbs to 100 lbs. Poppers and stick baits ranging from 100 grams to 180 grams – we will send a list with our current recommendations before you go. Light jigging set up rated for PE2 or PE4 with 60 lbs leader. 120 grams to 200 grams jigs. Slow jigs are our favourites. There are many different flight routes from Europe to Muscat, often at very attractive prices. They are either direct flights from Europe or with a single stop over. Muscat’s brand new airport is approx. 45 km from your hotel or resort. The roads are great so it is normally around a 30 minute drive.